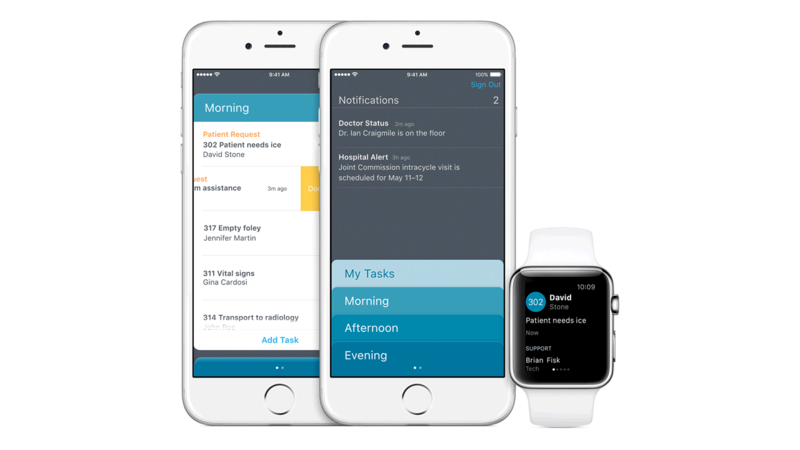 IBM MobileFirst for iOS Hospital Tech prioritizes care tasks, urgent requests and routine work duties for hospital techs. Update data from one place. Accept and update tasks during the day. Tasks and alerts are prioritized based on patients’ progress and clinical status. A to-do-list shows new notifications at the top and Patient Cards at the bottom. A tap on a Card pulls up the patient’s location, diagnosis, length of stay and time left before discharge. A Details tab provides more in-depth information, including recent vital and clinical measurements. View care plan tasks, with completed tasks by you or other team members shaded gray. With user-friendly iOS technology, it’s easy to start phone and FaceTime calls from your iPhone, iPad or Apple Watch. Find team contacts on Patient Cards and just tap the phone or text icons below their names. Instantly convey key results to doctors, surgeons and other key staff. Speak with team members to confirm orders, share insights, convey patient requests and help reduce patient wait times. Patient feedback and other non-verbal information can be recorded directly into their record, including pictures of wounds or dressings, voice dictation, file attachments and even sketches. Open a note and draw right on the app with a stylus or finger, tap the microphone to record a voice memo, and send the note to select team members if necessary. Once you save the note, the information is immediately available from the Patient Card to anyone with access to the patient. When you need to use both of your arms, just tap to call a team member or place a call, and speak hands-free using your device’s microphone. Text, phone, or FaceTime right from the app.